The premises at Thompsound Music are more than adequate for a small band to record live should this be what is required and there are more than enough channels to accommodate this. The space is probably more suited to solo projects and is perfect for a singer/songwriter or other solo artist to build up a project. Billy and his wife’s original Welsh band Amledd was recorded at Thompsound Music before the refit. So songs that start out as just a guitar and a voice can in time become big productions as some of Amledd’s tracks became. NB. The drums were recorded at Jon Hiseman’s Temple Music. Drums can now be recorded at Thompsound Music on the brand new Tama Superstar Hyperdrive kit with Sabien cymbals. Of course, the production can be as large or small as desired – a 40 piece string section is NOT compulsory but is most feasible! The purpose built vocal booth with floating floor and excellent sound insulation keeps the vocals nice and dry up until the mixing stage. Thompsound Music’s preference will always be to keep music live, but should recording vocals/instruments to backing tracks be required, this is also accommodated. Visit the Portfolio page for examples of recordings recorded at Thompsound Music . Thompsound Music can come to record your concert, gig or any other performance wherever it may be. Thompsound Music recently recorded the Classical Tango group Tango 5 at Sheffield Town Hall for a performance they were giving as part of a big music festival there. It might also be the case that where you rehearse is where you feel most comfortable and would like to record in that space. If the acoustics are suitable then this too is most feasible – as was the case when Billy went to record the acoustic trio Gadjo Jazz. Thompsound Music then takes the recording back to base and edits, mixes and masters there. Alternatively, the audio files can be handed over for you to do with as you wish. Visit the Portfolio page for examples of recordings recorded on location by Thompsound Music. For some time now, Billy has successfully offered his services as a session musician direct from Thompsound Music – online. The services of his colleagues are also available as mentioned. Using either Pro Tools or Logic Pro, Billy will record numerous takes and send them (tidied up and consolidated) to you to chop up/do with as you will, at your end. You can send an MP3 of the tracks you would like a session musician added to, or post a CD/DVD of the tracks (or send using Dropbox or YouSendIt etc…). Each session track is then consolidated to the start of each track you send. Alternatively, you could send each track as a Pro Tools or Logic session. These can then simply be opened up and added to. Please state your preference of format (up to 24bit, 96KHz) to fit your project’s requirements. Some clients have come specifically to Billy Thompson for this service with a predisposed knowledge of what Billy himself can offer. It is recommended that you look at Billy’s website to find out what sounds Billy can get from a violin. Or go to the Portfolio page. 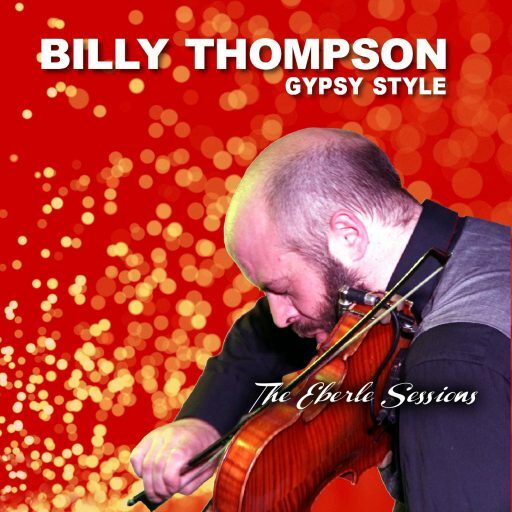 Billy approaches each session as a unique entity with his combination of classical training, jazz/gypsy jazz leanings, improvisation and rock/folk rock tendencies coupled with a myriad of sound effect choices. Should a specific arrangement be required please include sheet music or a midi file of what you would like to be played along with the audio. For an additional fee a string arrangement can be provided. Anything else you require on a particular track just ask. Visit the Portfolio page for examples of sessions recorded at Thompsound Music for clients Worldwide.